We will start our tour at 7 am in midtown Manhattan, 8th Avenue between 33rd and 34th Street (by Duane Reade) DON'T BE LATE! Come 15 minutes early to sign in. We will start the day driving to New Jersey Botanical Garden, “The Garden” of the Garden State. 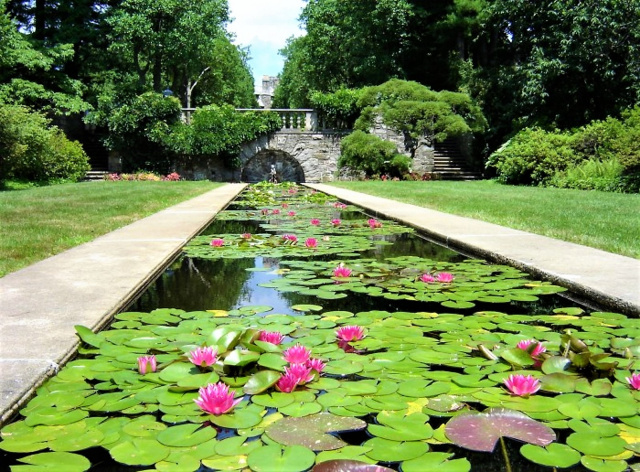 This is a 96-acre botanical garden nestled in the Skylands region of the Ramapo Mountains. Here you will have time on your own to wander amongst the elegance of formal gardens and gentle paths winding through woods. Some of the highlights include a Wildflower Garden, interesting non-native trees, a Terrace Garden with a series of five terraces, each with its own distinctive essence; a reflecting pool containing a number of hybrid waterlilies and tropical fish. Other highlights include a summer garden, and a Lilac Garden with an extensive collection of different varieties of lilac. Next, we will visit the Ringwood Manor, a National Historic Landmark District. It was the site of an ironworks and home to a number of well-known ironmasters from the 1740s to the late 19th century. The current manor house was built in 1807. One of the manor's last owners was Abram S. Hewitt, ironmaster, educator, lawyer, U.S. Congressman, and mayor of New York City. In 1938, the house, its contents, and the surrounding property were donated to the State of New Jersey as a museum and a state park. Today, Ringwood Manor is a central part of Ringwood State Park and administered by the NJ Department of Environmental Protection, a division of Parks and Forestry. You will receive a guided tour of the manor house and learn about its rich history. We will eat lunch at a local restaurant. After lunch, we will drive to Museum Village. This is a unique and inviting open-air historical 17-acre museum which offers the opportunity for visitors to see, touch, hear, and understand life in 19th century America. Using a large collection of diverse artifacts, the museum provides hands-on educational experiences and exhibits that illustrate the transition from a rural to an industrial culture and economy in America. While visiting the exhibit buildings at the Museum Village, you can shop in a 130-year-old general store, see a real Mastodon skeleton, make a candle, step inside a 200-year-old log cabin, sit in a one-room schoolhouse, and watch a broom being made. Amongst the exhibits, you will also find a Natural History Building. You will also see farm animals from a typical 19th century farm. We will be back in NYC at approximately 5:30 pm. FOOTWEAR: Good walking shoes or sneakers with good traction will do as well. Do not wear dress shoes or high heels.